Our very Full House: I actually did it. I gave my boys a bath. But Kathy's sweet post and pictures of bathtime with her 3 boys totally inspired me.....and I must say, bath time was much different this time than it was the last time I tried it (many months ago)! 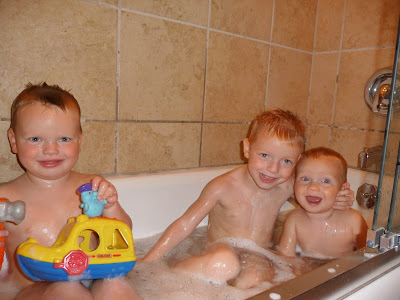 Ethan didn't need any help to stay above water *grin*, and they all played and shared tub toys very well together. We bathed in the new bathroom that has a tub with glass doors to keep all of that splashing water in--and there was tons of it, let me just tell you! While the boys played to their heart's content, I kept a careful eye on them and did a few minor chores (closeby, of course) around the house. I must say--It was actually enjoyable for me! Naturally, the boys loved it too. We may will have to do bathtime more often! Yeah Devin! That is so cute it hurts my heart! Those smiles! it has saved my sanity more than once! glad it worked for ya'll this time! Too cute, it gives me hope one day we can do all three at once. Cory does 90% of the baths around here, which is nice for me! Caden and Carter love to splash and make quite the mess. Your boys are precious as always! First of all, this is the first time on your blog. HOW ADORABLE!!! Anyway, I am glad I am not the only one that showers my children. I actually started it for different reasons, the biggest reason being that my daughters hair would not get completely washed in the bathtub. BUT, I always felt funny giving toddlers a shower. I don't feel as self-conscious anymore. You are right though, enjoying a bath here and there is fun too. The pictures are sooo cute!